We offer Glasser fiberglass upright bass bows because they are a good quality and dependable. Fiberglass bows are great to new students or 'new' to the bow and want to pay the least amount. There are other Chinese made fiberglass bass bows to buy, but we have found (the hard way), that they tended to fall apart quickly. Are brand and belief here is and has always been, only to offer the best quality materials or accessories. It doesn't make sense to buy or save $30-40 on a bow, only to have to replace a junky bow 6 months later. The Glasser bows have been around a long time. It was Steve's first bow in 1978!! Nowadays, they come nicely done with good Mongolian horse tail hair that grab very well. We offer them in both French or German model and in the various different sizes from 1/8 size to 3/4 size. A word about size and ordering. For students (or student's parents), buy the size your teacher tells you to buy. The size of the bow doesn't always have to match the size of the bass. First, 3/4 size bow IS a full size bow. Don't buy a bow advertised or listed as a 4/4 size. In the few occasions that we've seen these, they seemed better suited for rowboat oars than bass bows. Again, 3/4 IS a full size. About the fractional sizes bass bows: Unless your teacher specifically requires a specific size, it's been our experience here that for students playing a 1/4 bass, a 1/2 size bow matches the student and bass better. (So, if your student plays a 1/4 size bass, we recommend a 1/2 bow. If it is a 1/2 bass, then either a 1/2 or 3/4 bow will work fine. This way too, getting a 3/4 bow, you can keep it without having to get a longer one later. The size difference is not much between 'next to' sizes, though don't get a 3/4 size bow for a 1/4 size bass. Again, if your teacher specifically says to get a particular size and they are aware of this small difference, then by all means, get the one they tell you to. Ordering a Glasser Upright Bass bow: $118.00 (choose model: French or German, then choose size: 3/4, 1/2, 1/4 or 1/8). 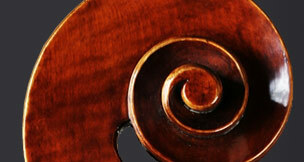 Bows do not come with rosin, so please go to our bass rosins page to select one.